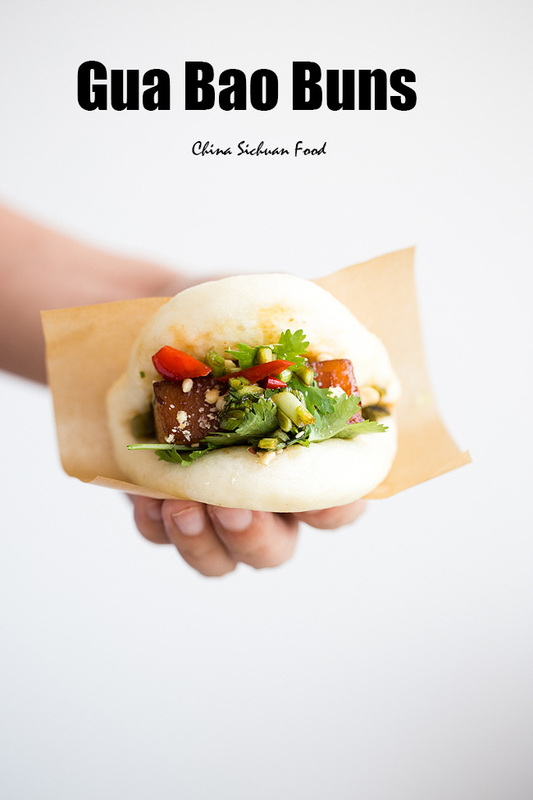 Learn how to make the well balanced Taiwan style pork belly buns with super soft, fluffy steamed buns and full of flavor fillings. 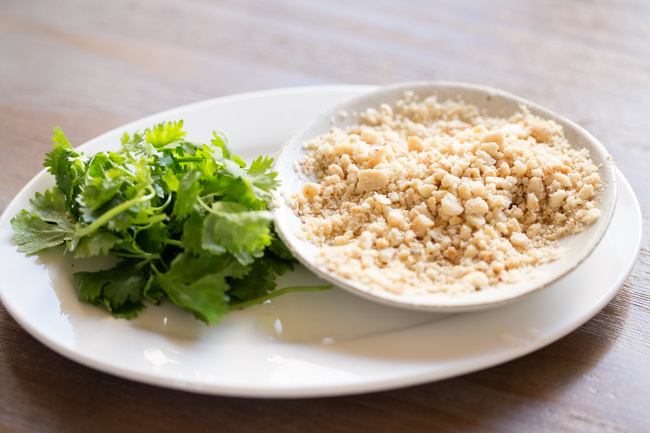 I love the nutty taste with salty pork belly, sweet peanuts, sour fried mustard green and freshness of coriander leaves . 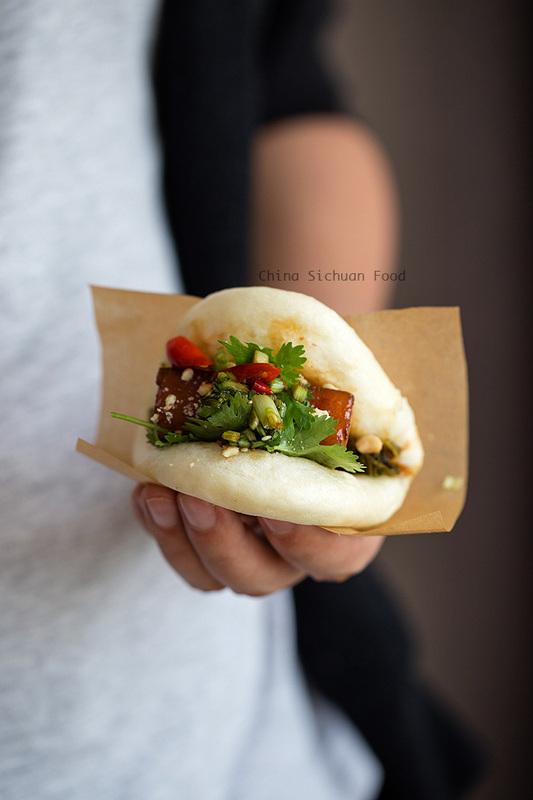 Gua Bao or Taiwanese pork belly bun is one of the most popular food in Taiwan. As a big Taiwan food fan, I always want to reproduce them at home. Previously, you must have read taiwanese minced pork over rice (lu rou fan) and taiwanese peppercorn chicken. Taiwan food shares lots of similarities with food in mainland China. However they are so unique due to different combinations and serving ways. It is a custom to eat gua bao especially at the end of one year. 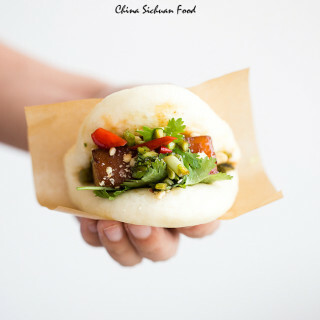 Gua Bao has an interesting name “tiger bites pig” due to the mouth like bun shell and the pig meat inside. 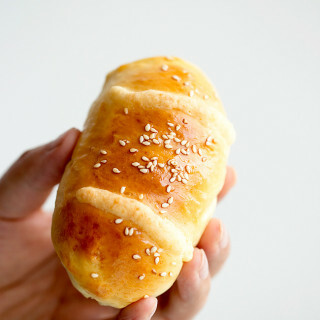 The unique fold over buns are popular in mainland China too, with another lovely name: lotus leaf buns (荷叶包) as it can fold closely just like lotus leaf. We usually match lotus leaf buns with minced meat and vegetables too. If you did not taste only of those food I mentioned above, the universal truth that will push you to make at least one batch in kitchen is that flour+meat =one of the the best tastes in the world. 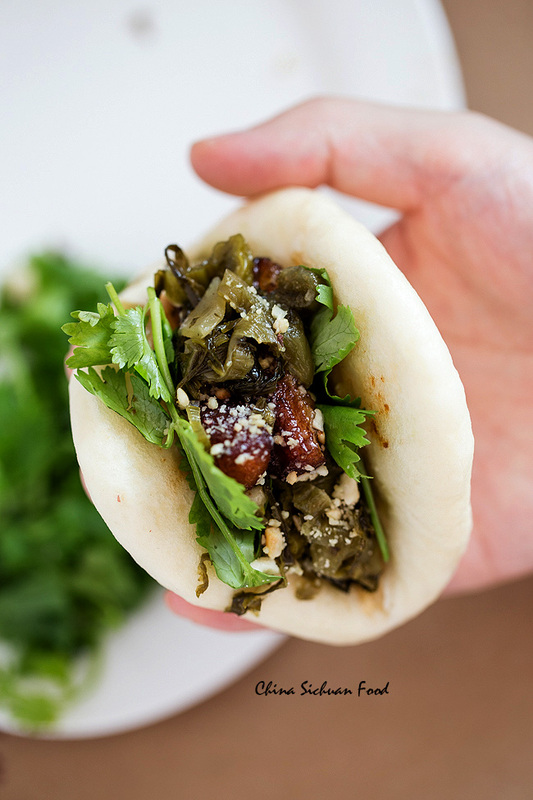 I can find my confidence in an old Chinese snack in the old city Xi’an– rou jia mo. That’s the mainland five star pork belly buns. 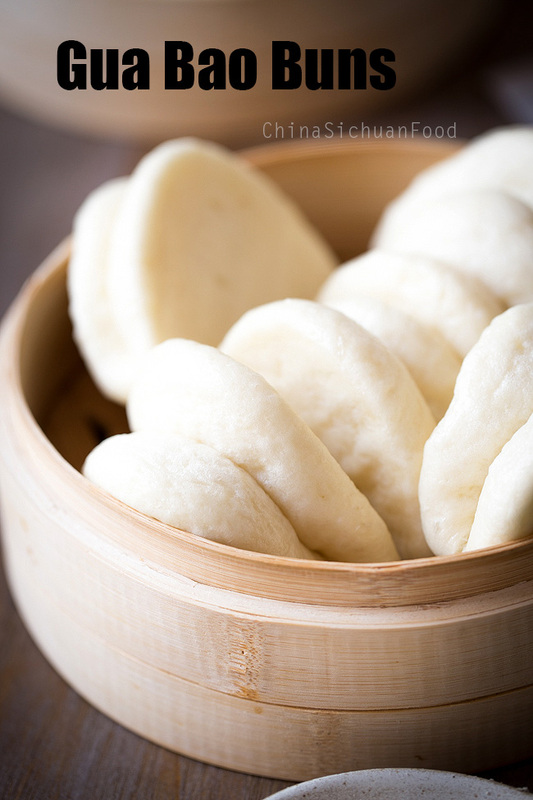 This recipe’s bun dough is similar to Chinese steamed buns, but I add 1 tablespoon of cooking oil as Gua Bao contains meat filling. 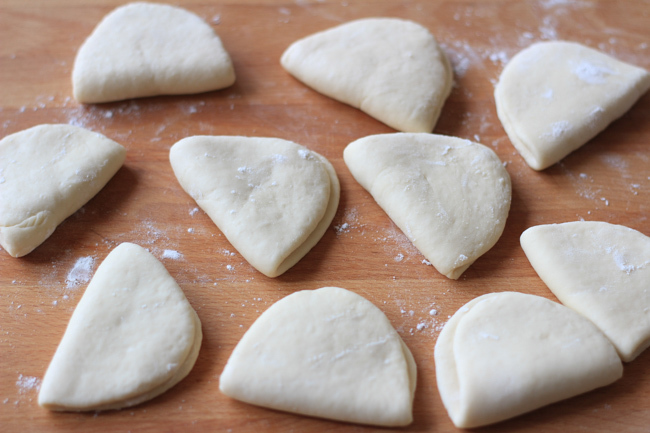 Usually for meat filling dough, we add a small amount of oil in the dough. 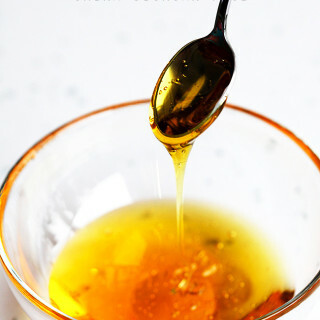 It prevents the oily filling permeate the skin. In a stand mixer, mix all the ingredients for 9-12 minutes with hook and low speed until get a elastic, smooth and soft dough. Shape it to a large ball and cover with a wet cloth. Set aside for proofing (around 1 hour). When the dough is about 1.5 times (or double, please do not over-proofed) in size, transfer out and re-knead until smooth in surface again (key step to smooth surface). Divide into 8 portions. Knead each of the portions for 1 or 2 minutes until smooth. Roll each of the small balls to an oval like shape. 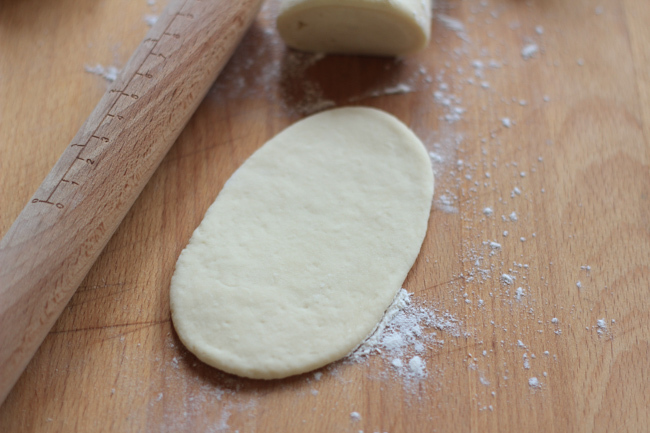 Slightly dust the oval (or brush a layer of oil on surface) and fold the dough over by the middle. Place them in steamer, turn up the fire and heat for 2-3 minutes, turn off the fire and wait for 15 minutes. Re-start the fire and steam the buns for 10 minutes after the water boils. 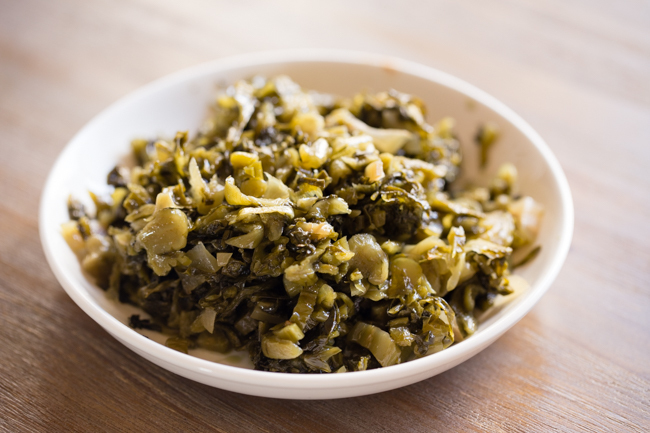 Pickled mustard green is known as Suan cai (酸菜) in Chinese with a very unique sour taste. 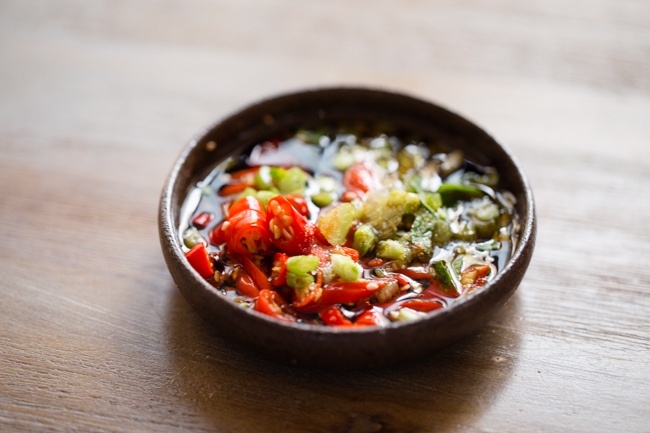 After stir-frying, it presents a milder sour taste that can kill any greasy feeling. 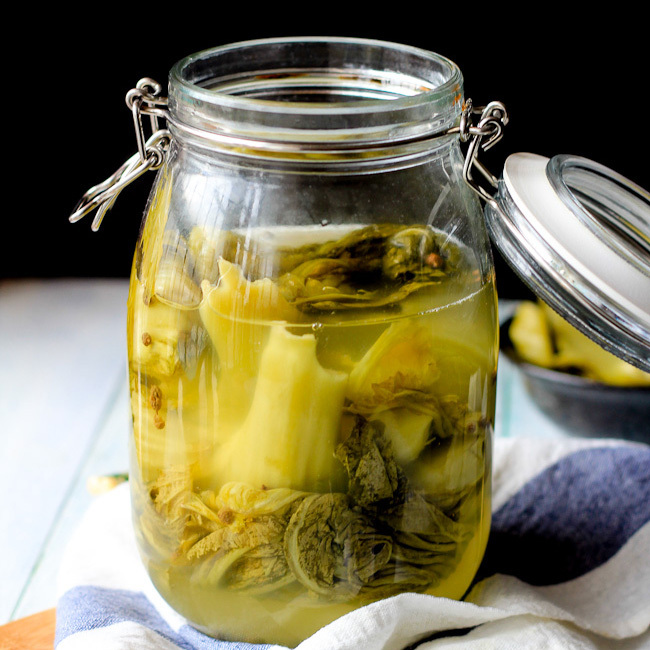 If this one is unavailable, you can use other pickles like Kimchi. The real taiwanese version uses sweet peanuts. Firstly toast the peanuts and then ground into larger particles, mix with 1 tablespoon of sugar powder. 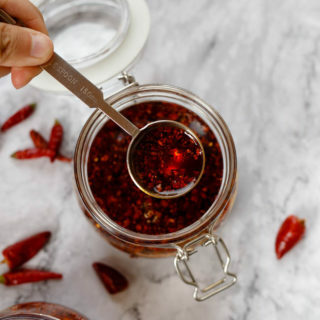 2 fresh thai pepper+2 minced garlic+1 teaspoon minced scallion+1 tbsp light soy sauce+1 tbsp sesame oil. Taiwan style braised pork in the mail role of the filling. 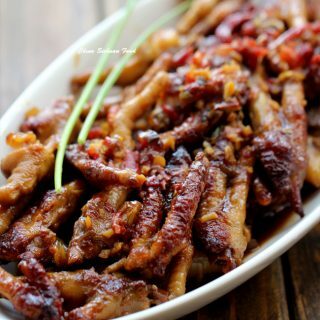 Since it is a quite long post, I hope you can directly check Taiwan braised pork lu rou fan. For meat lovers (like my husband), use whole slab of pork belly. If you do not want so much meat a time, break the slab into several smaller pieces and match with more peanuts and fried Suan cai. That’s my favorite version. Cut the pork belly into large slabs. 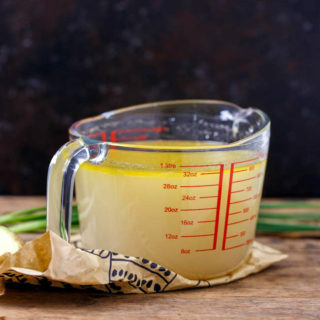 Place in a pot with enough cold water, bring to a boil and continue cooking for 1 to 2 minutes. Transfer out, drain and clean. 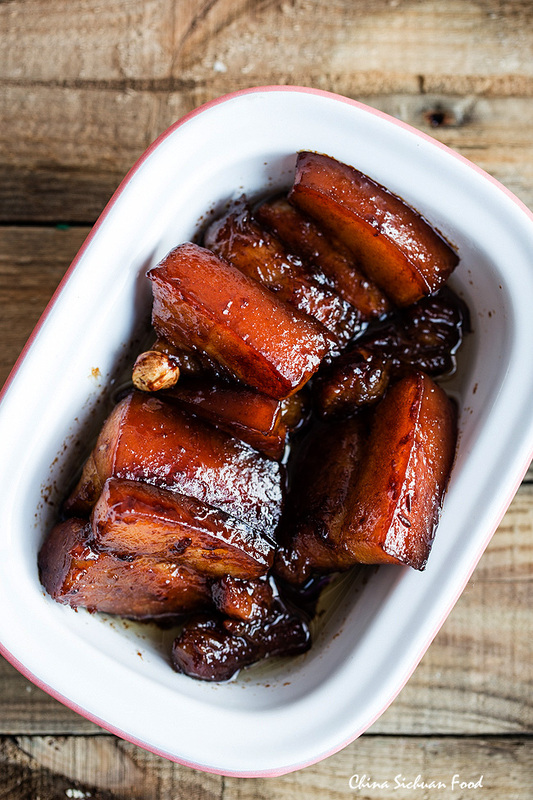 Heat around 1 tablespoons of oil in a wok and then fry the pork belly until browned. Transfer to a simmering pot, add all the other ingredients and enough water except fried shallots, bring to a boil and continue cooking for around 1hour. Add fried shallots if you plan to use and continue simmering for 30 minutes to 50 minutes until the pork belly becomes really soft. In a stand mixer, mix all the ingredients for 9-12 minutes with hook and low speed until get a elastic, smooth and soft dough. Shape it to a large ball and cover with wet cloth. Set aside for proofing (around 1 hour). When the dough is about 1.5 times in size, transfer out and re-knead until smooth in surface again (key step to smooth surface). Then divide into 8 portions. Knead each of the portions for 1 or 2 minutes until they are smooth. And then roll each of the small balls to an oval like shape. Mix all the ingredients for optional Chili sauce. Heat around 3 tablespoons of oil in wok and then fry minced pickled mustard green for 2-3 minutes until aroma. Smash toasted peanuts and mix with 1 tablespoon of sugar powder. Add braised pork, mustard green, sweet smashed peanuts and fresh coriander leaves. 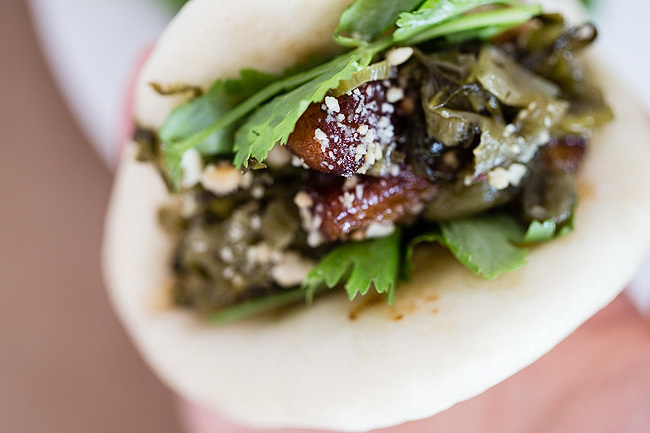 The Nutrition Facts is based on each single Gua Bao. I hope you will love it. 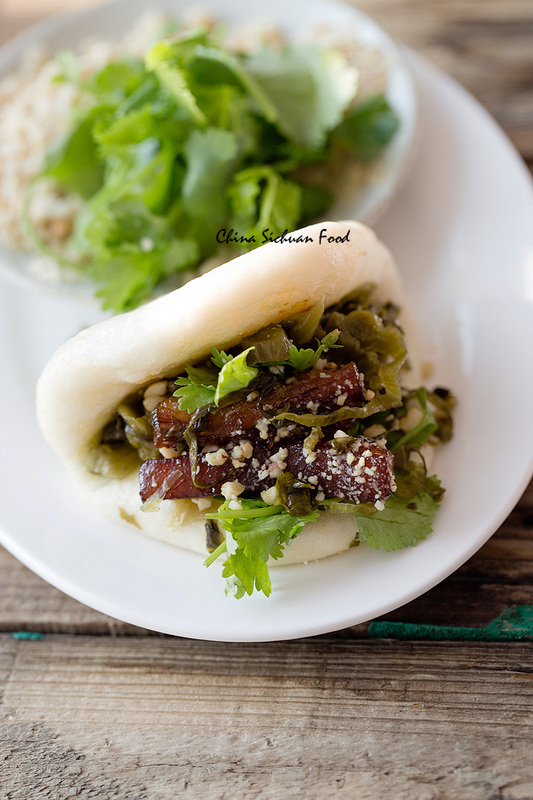 If you make Gua Bao at home, tag me @chinasichuanfood on Instagram and let me know. Thanks, your blog is amazing too! I love Taïwan food . 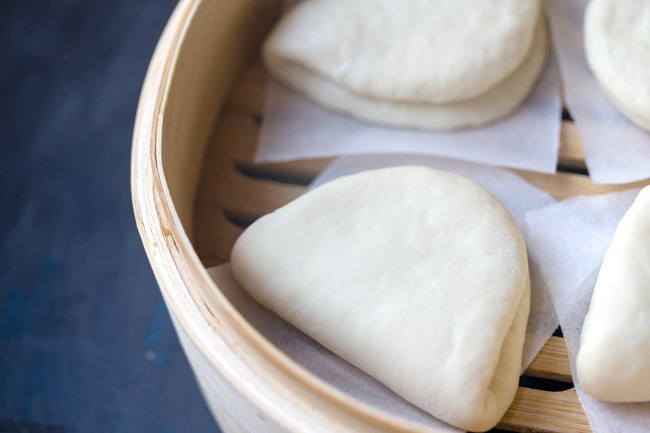 I tested this bao, they are so delicious, so sweeet and tasty …. thank you for this recipe ! A beautiful gourmet discovery! We love it ! I’ve tried a few times and the dought won’t rise while resting. 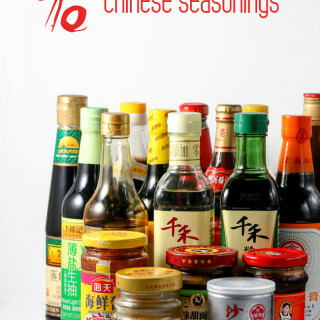 Which makes sense as instant yeast is activated by heat in the cooking process. Are you sure it is not active dry yeast you are using? I usually use instant yeast which can be directly mixed with dry ingredients. If you use active dry yeast, you need to dissolve in warm water firstly. Hi Elaine! 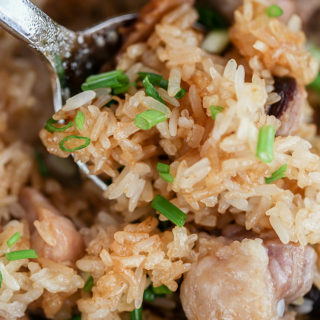 I can’t wait to try this recipe this weekend! I was wondering if when kneading the buns, do you do that on a floured surface? or will that change the texture/flavour? If you feel the dough is sticky, you can slightly dust the surface. Hi, I just tried making this. I’m wondering why the bread is an off white colour, instead of white, like in your photos? The most possible reason might be the flour. Usually if you use unbleached flour, the buns present a slightly yellow color. Hi! I had a quick question. When i first open the steamer after the time is up, they look perfect, but then some parts shrivel up and looks like raw, shiny dough. They didn’t alter the taste, but they’re just kind of ugly. I probably had 5 of them turn. What could the problem be? Overheating/overcooking? Thanks in advance! If most of the dun turns out ugly, the dough need more kneading after first proofing. There might be bubbles contained in the small buns. If you are quite sure that the work for the second kneading is great, then check if there is any water drops on the surface? Next time, use a wet cloth to cover the steamer firstly before cover the lid. This can avoid the water dropping on the buns. I hope the above information can be helpful. Keep going! Can’t wait to try your recipe out. I had these at a restaurant recently and they were to die for but so expensive. Monica, most time consuming foods are quite expensive. Homemade version is brilliant too. what is diffrent in the way the bun turns out in the end if you use water insted of milk? It is 100% ok to use water. With water, the bun has stronger original aroma from wheats. However if milk is used, it has a brighter color and a faint touch of milky aroma. Hi your blog looks amazing! I just tried this recipe and I was wondering if the water amount for buns are right. I had 140ml milk but the dough was too dry so I also add 125ml water and it became okay. If you use 2 cups flour, it should be around 230g to 240g. SO it is completely ok to use 125ml water or 140ml milk. Those buns can be made in advance. After steaming, let them cool down completely and freeze in air-tight bag. Next time when your fillings are well prepared, re-steaming the buns before serving. I’ve got a couple more questions, do I re-steam from frozen or do I thaw them? How long should I re-steam them for? I am going to try to do them this weekend. Steam directly from frozen buns, around 10 minutes after the water boils. This might seem silly but do I take out the buns after waiting 15 mins to reheat the steamer before adding the buns back in and steam for the additional 10 minutes? No, not necessary. Steam directly.